Facebook reported its fourth-quarter results on Wednesday. Its earnings and revenue topped Wall Street’s expectations, excluding a tax charge related to the recently passed tax law. But the company announced a significant decline in usage of its service and what may be the first-ever drop in daily users in the United States. The declines in usage and US daily users come as the company has sought to address concerns about its service being used to spread propaganda and fake news and about social-media addiction. Even as it reported standout earnings, Facebook gave investors something to worry about on Wednesday – a marked decline in usage of its service. The amount of time users are spending on the site declined by a whopping 50 million hours a day, company CEO Mark Zuckerberg said, describing 2017 as a strong but “hard” year for the company. Investors quickly sold Facebook’s stock on the news of the usage decline, but Facebook executives appeared to have regained the trust of shareholders during the conference call with analysts. After sliding as much as 5% in after hours trading, Facebook’s stock was back up roughly 1.7% when the conference call ended. During the call, Zuckerberg and his management team reiterated the company’s efforts to make Facebook a place where its more than 2 billion monthly users spend “meaningful” time on its social network, and to crack down on misinformation and problematic content that has spread on the site. 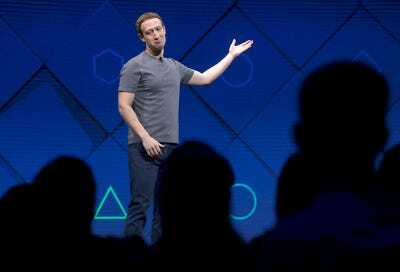 “We’ve seen abuse on our platform, including interference from nation states,” Zuckerberg said. Facebook said it expects advertising impressions in the coming year to increase “modestly” and noted that ad revenue growth would continue to decelerate, after years of supercharged growth fuelled by mobile newsfeed ads. In the final three months of 2017, Facebook boosted its results by keeping costs in check. Its total top-line and operating costs amounted to 43% of its revenue in the just-completed quarter, compared with 48% a year earlier. 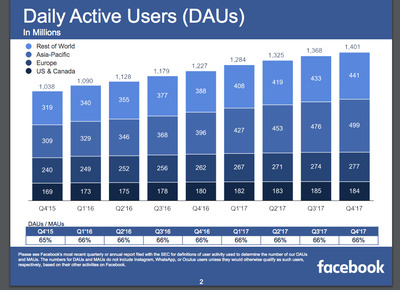 Facebook also reported what seems to be its first-ever decline in daily-active users in the United States and Canada. That number, which has been plateauing in recent quarters, fell from 185 million to 184 million. 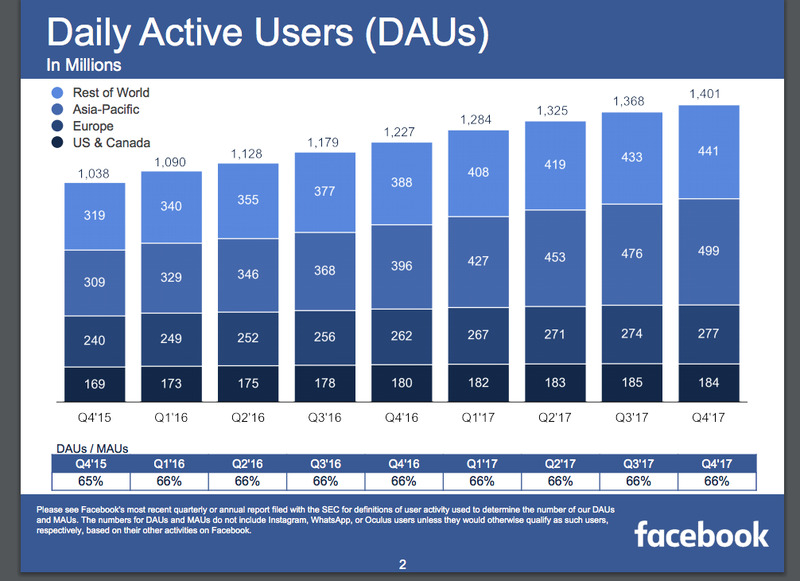 Despite that decline, the company’s total daily active users worldwide rose to 1.4 billion from 1.37 billion in the third quarter. Earnings per share (GAAP): $US1.44; analysts were expecting $US1.95. However, Facebook’s GAAP EPS included 77 cents of taxes related to the new tax law. Without them, its earnings would have been $US2.21 a share. The company was able to drive such standout results in part by boosting the average revenue it saw for each user. Average revenue per user was up across each of the major geographic areas in which the company operates, but rose sharply in the United States and Canada. There, average revenue per user was up 35% from the fourth quarter of 2016 to $US26.76. The company’s report follows growing scrutiny and criticism of it regarding Russia’s alleged use of the social network to spread propaganda to influence the 2016 presidential campaign, the spread of fake news stories through the site, and the rise of reports of social-media addiction. Facebook officials have recently announced steps to address such concerns, but warned that its efforts may cut back on use of its service. Analysts and investors had been looking for word on how big an impact the company expected from such efforts.